My nephew-in-law (is that what you call your brother-in-law's nephew?) who is just learning to talk is very interested in animals. 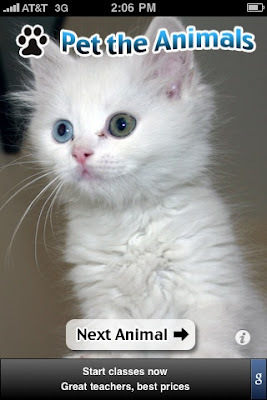 I looked for a few free animal-related apps on my iPhone, and was impressed with both Pet the Animals and Vocal Zoo (note: both links likely will open a web page, then the iTunes Store, but will not download the app unless you authorize it). Pet the Animals features a variety of full-screen animals, that, when petted, will make a sound and "purr" (the phone will vibrate). 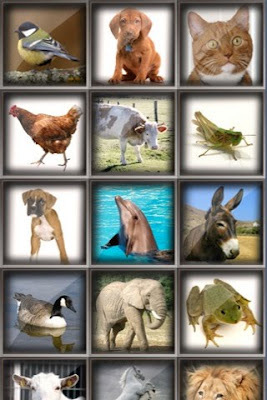 Vocal Zoo features a grid of animals that will make their sounds when touched. Both kept little Ryan very amused- he kept running away from the phone and coming back giggling, while attempting to imitate a lot of the sounds. 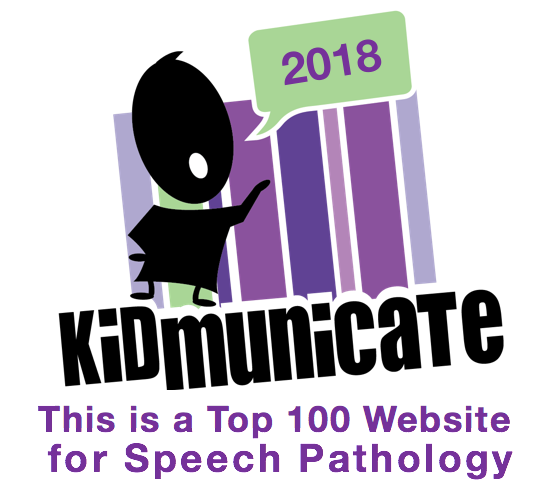 Animal Sounds are clearly a great way to elicit speech sounds. Cause-effect relationships (and a good point, for OTs) can be a great target for both of these activities. With older students, apps such as Vocal Zoo could be a good context for barrier/ "I Spy" description activities.